1. Get going by heating a little groundnut oil in a wok and brown off the pieces of pork. Remove and set aside until later. I don’t marinade my pork for this in advance as it is such a flavourful dish without it. Wipe out the pan and pop another glug of oil in over a medium to high heat. 2. Pop in the garlic, ginger, shallot and whole chillies and cook until softening. Meanwhile make the sauce by adding the honey, soy, rice wine and chilli bean paste. Have a taste and adjust if needed but this is the perfect blend of hot, sweet and sharp! 3. Add the sauce to the pan and allow to bubble for a couple of minutes until it looks like it is starting to turn gorgeously sticky. Return the pork to the pan and coat with the sauce. Continue to bubble away until the pork is cooked through and the sauce has reduced. At the last minute throw in the spring onion and serve straightaway. I served it with delicious sesame pak choi and rice. 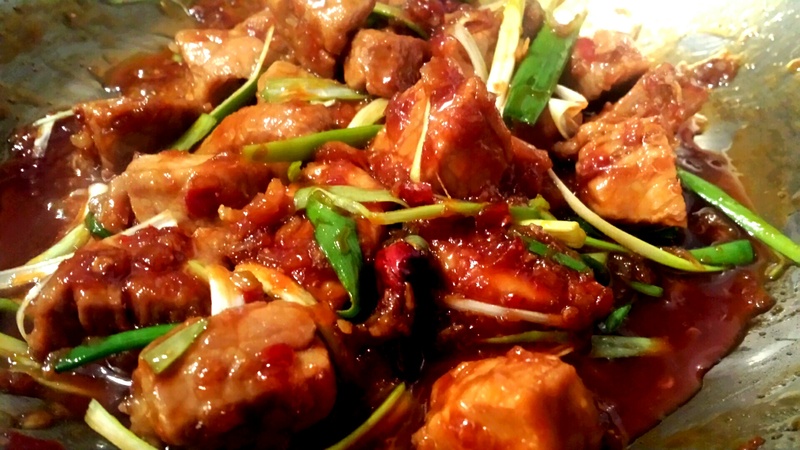 Chinese style sticky chilli pork- a winning dish!